Do you know what a Work Breakdown Structure (WBS) is? Of course you do. But, are you using it appropriately and effectively? Let’s do a quick check. This article is an in-depth review of the WBS Coach which can help you improve your project management skills and also earn PDUs for PMP certification renewal. Do you understand the process of creating a WBS? Do you know the pre-requisites for creating a WBS? Do you know how to organize your WBS for most optimal definition and control? Do you use your WBS for monitoring and controlling your project? Do you use your WBS as a communication tool? Are you familiar with the tools to create a WBS? If you answered ‘no’ to more than one question, then you may want to continue reading this article. WBS Coach is a new self-paced project management training program that helps you unleash the true power of a Work Breakdown Structure. Here are my top 5 reasons to invest in this program. If you want to hone your project management skills and take them up a few notches, this is a great opportunity for you. WBS Coach allows you to harness the full potential of the WBS to better plan, execute, manage and control your projects. The program hand-holds you through several work breakdown structure examples and shows you how to create a WBS from scratch and using WBS Templates. You not only learn the tools to create the WBS, but also understand the process involved. Overall, this program gives you a solid foundation in WBS concepts and project management best practices, and helps improve chances of project success. Complete eBook (in PDF format) that also serves as a transcript of the audio lessons. You can read the eBook or simply sit back and listen to the audio. Video tutorials of at least 7 tools to create WBS. Note: It’s also compatible with smartphones like iPhones and Blackberries, and tablet devices like the iPad. 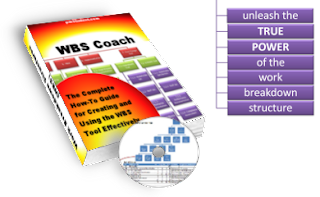 The WBS Coach provides more than “5 hours” of audio, video and textual based training. If you are a PMI-certified PMP, you can claim 5 PDUs under Category 2-SDL (Self-Directed Learning). It even provides detailed step by step instructions for registering the PDUs with PMI. One of the thing I always appreciate as a consumer is transparency. If the seller tells me exactly what I’m going to get and also lets me try the product, or give a sample to test, I feel more comfortable with the deal. I really appreciate the way Josh promotes his WBS Coach program. For instance, he offers a free report Top 7 WBS Mistakes Project Managers make. After following a simple registration process, you get the report. He follows up the report with lot of bonus material, which gives a detailed insight into his program. After reviewing all the material, you are almost compelled to purchase the program. I do not recommend you to opt for his program right away. Rather I recommend you to subscribe to the free report first, learn more about the program, and then decide whether it’s right for you. At around $40, it’s one of the cheapest options to earn PDUs. And last but not the least, the money back guarantee. This is another thing that I personally give importance to. It shows the seller’s confidence in his/her own product and offers me peace of mind. Josh offered me an opportunity to sign up as an affiliate of his WBS Coach program, and promote it on this site. I had no previous associations with Josh and being a skeptical that I am, I requested for an evaluation copy, so that I could review the program first. Josh obliged and immediately provided one. I took a couple weeks to review the program. After reviewing it thoroughly, the first thing I did was to register my PDUs :). Then I congratulated Josh for his effort and told him that I had no reservations in promoting his program. Now WBS Coach is among a selected set of programs that I endorse. So, if you buy the WBS Coach with my recommendation, you’ll be helping me keep this site going. If you have any comments or questions, you can either post them on this page or send them to Josh directly. Much as I respect Josh, I think his approach in encouraging people to create NEW WBS for each project is not a "best practice". At least in construction and the "built environment", we "Building Information Modeling" (BIM) is the driving force behind STANDARDIZED Work Breakdown Structures. The best example of this is the Construction Specifications Institute's "Masterformat" or "Uniformat" or the joint effort between ISO and CIS in creating OmniClass http://www.omniclass.org"
Bottom line here- I urge my IT and Telecommunications colleagues to consider adopting an INDUSTRY WIDE standardized WBS and you will be surprised at how much easier it makes your life. I can understand having a standardized WBS and the advantages associated with it, but wouldn't that only work if the projects are similar in nature? I'm not familiar with the construction industry, but I'm trying to understand how a standardized WBS will help when projects are unique in nature? Many of the projects that I work on have their own unique WBS. We do occasionally use ones from previous projects as template when the previous project is similar in nature to the current. Please educate us more on this. I also welcome your comment Paul (Dr. PDG), as always. Everyone, Dr. Giammalvo is a frequent contributor to my blog at http://pmstudent.com , and even though he and I disagree on some points, we agree on the majority of the fundamentals. And I always love my interactions with him and others so we can all grow professionally. I also have not managed projects in construction. I've worked in the Telecommunications, Financial, and Aerospace industries. And at a high level in terms of guidelines, I can agree that projects in a specific niche will end up having similar WBS structures. The problem I've found is when this is taken to extremes. In my world, every project is unique. We have different subsystems depending on the client, mix of technologies, and other specifics of the implementation. So even if you end up coming up with your own template, or using an industry guideline template, I feel it's critical that every project manager understand the core principles that make an effective WBS. And you can only REALLY understand that at a gut level when you've done it from scratch, multiple times. What I teach are those fundamentals, which can then enable you to go even further in your mastery of the WBS for deliverables definition and management.